Monday night was the annual gathering of Canadian blues musicians, promoters and uber-fans. It's held in the newest and fanciest concert hall in Toronto, Koerner Hall. Pretty ritzy. I had intended to buy a new suit for the occasion, well, mostly for the Folk Awards event that I hosted last month but in the end it was black jeans for both. A lot of good lookin' bluesers in the hall. The highlight of the show was "Funky Louise", alter-ego of host Shakura S'Aida. She had me in stitches - search for Funky Louise on YouTube and you'll see this hilarious promo for the awards also featuring co-host Treasa Levasseur. There were many great performances but my favourite musical moment was Bill Johnson and what a great guitar sound he had. I had to ask, what was that amp? ...and he told me it's a hand-made amp made in his hometown, Victoria. They're called Toneliner. And they have the tone alright, though the fingers of Bill Johnson had a lot to do with it. I met Bill five or six years ago when he came to the Blues Summit and backed up Layla Zoe at the Blues Campfire. I can't remember if he sang himself at that time but I do remember that he got me a gig in Victoria and I am eternally grateful to him for that. I've been playing his album a lot and so have a lot of other people, apparently, because it was nominated for Blues Album of the Year even though he's hardly ever played in this part of the country. I'd love to see him do a whole evening. Speaking of sound I've got to say when you're in a hall like that, you're supposed to be able to close your eyes and it should sound like you're in a big living room listening to a very big, very expensive stereo. I'm always a bit taken aback when I'm in a premier concert hall and it still sounds like you're just in a big hall. I don't want to hear the room, I don't want to hear the speakers working - I just want to hear the music. Come to any show at the jazz festival and you'll see what I'm talking about - and that's in a bloody tent! After the awards a few of us made our way to the hotel and had an impromptu jam session in Rick Taylor's room where I had the pleasure of sitting across from Joe Murphy and hearing him for the first time (he did a tune at the Awards but he is best appreciated up close and personal). 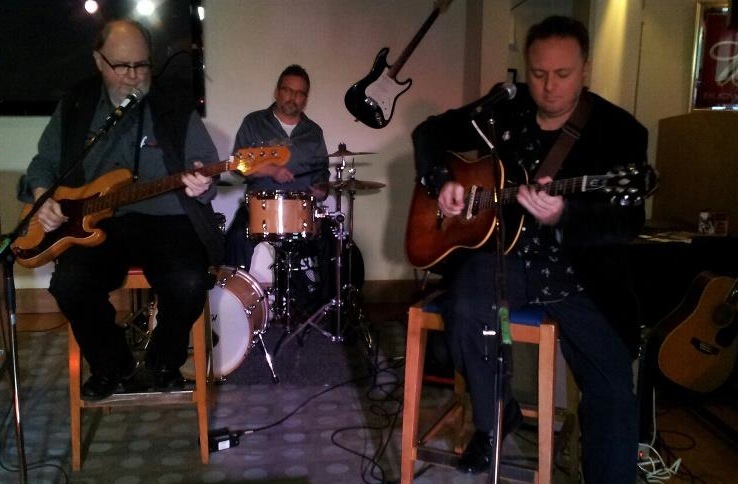 I never heard of Joe Murphy until last month though he has been a fixture on the East Coast blues scene for decades and I can now attest that he is definitely the proverbial "real deal". Great meeting you, Joe, and great to say hello to many other visiting artists who I only run into once or twice a year. It was a delight to look across the lobby and see the chrerub-face of Tim Vaughn smiling at me. Tim had introduced himself to me at a Blues Summit five or six years ago - he was just a teenager then, surely the youngest delegate ever at the Blues Summit, and now here he was attending as a nominee in the "new artist" category. Good on you, Tim. The Delta Blues Campfire on Sunday afternoon was the perfect way to get in a blues mood for tonight's Maple Blues Awards. 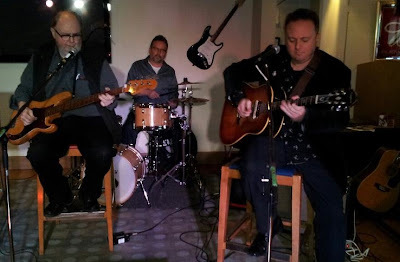 Pictured above (photo by Stilleto Rose) is the rhythm section, yours truly on bass and Malcolm Gould on drums along with Nanaimo's David Gogo, nominee for Guitar Player of the Year and Electric Act of the Year. Later were joined by Steve Marriner of Monkey Junk (7 nominations) and the larger-than-life Matt Andersen (who has three nominations, I think). Andrew Burton is a local guitarist whom I've never me and he played some sweet sounds even though he had a less-than-deal setup plugged directly into the board. Speaking of the board, we had the formidable Rob Boyd mixing the sound and keeping everything humming along (OK, maybe that's a bad choice of words). Who knew that Rob was a bass player in a previous incarnation. He sat in for a couple of tunes and he rocked! Ken and Peggy from Belleville Loyalist Blues Brotherhood joined in (blues version of a Crystal Gayle song? Only at the Campfire). Host of Monarch's regular open mic Brian Gladstone was the first player to show up with guitar in hand and he kicked off the session with some fine fingerpicking. And a big thank you to Mojo Willie (aka Bill Rymer) who played a few tunes while I took a bit of a break - there's no breaks at a campfire. I'm thinking I forgot somebody...anyway it was great to have these luminaries joining in at the campfire and a real thrill for the local players, including myself, to play with them. I was thinking I should have got some autographs on my guitar after these great players played it. Jamming around the campfire is not exactly a career development strategy but these guys are all about the music. They just want to play. I was especially thrilled to meet and play with the legendary Joe Mavety. He is of course mostly remembered for his collaboration with Marianne Faithful but nowadays he's living in Port Credit and playing around the west end. I always had a little bee in my bonnet about this guy because back in the early 90s, the first band I played with in Toronto was Blue Willow and when it was time to make a record Joe Mavety was the "ringer" that they brought in. That always stuck in my craw a little bit. I figured I could play those solos as well as he did :-( Now that I recall those sessions, I remember producer Michael Fonfara bringing in Carlos de Junco and maybe somebody else so he would have two or three solos to choose from and a couple of my solos got bumped. That was brutal. Oh well, "Welcome to Toronto!" The First Delta Blues Campfire was held in January 2007 as part of the Blues Summit. Pictured above (l to r.) Ken Whiteley, Mark "Bird" Stafford, Mr. Rick, Rick Fines, Danny Marks and host Brian Blain. The Maple Blues Awards week-end always attracts a large number of blues artists from all over the country and The Blues Campfire is their chance to meet and jam with local players and other blues artists from outside Ontario. The Campfire has provide many artists with the first opportunity to jam with someone who's work they've admired with some of these connections have led to collaborations on recordings and tours. 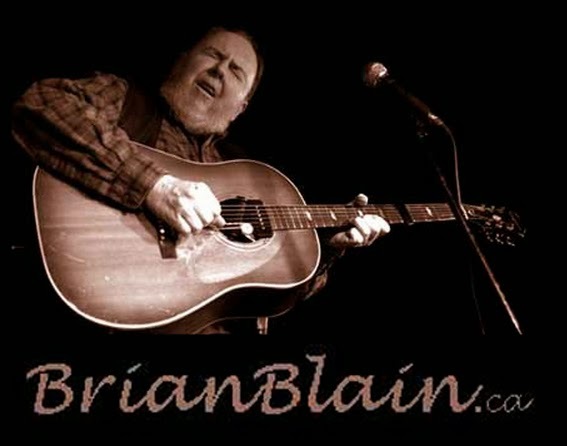 The Blues Campfire is hosted by well-known blues editor/writer/guitar picker/bass player Brian Blain and has been a highlight of previous Blues Summits, OCFF and Folk Alliance conferences as well as festivals like Winterfolk and Harvest Jazz and Blues. This year's campfire welcomes Maple Blues Awards nominees, presenters and guests to meet and jam in a casual setting.